Jeptha Miller, a chemist and wine-merchant, and for some time secretary to the Saffron Walden Savings Bank. Thomas Spurgeon, a doctor and for many years a town councillor. Thomas Frye, town treasurer, and for many years a churchwarden, was a schoolmaster who conducted an academy at Dorset House, Church Street, where he established a reputation as a stern disciplinarian. John Thomas Frye, professor of music and organist for 64 years at the parish church, lectured several times on musical subjects, notably January 12th 1849, when he gave "An historical lecture on Music". Joshua Clarke (whose brother of Joseph was a town councillor and mayor 10 times), a maltster carrying on business in High Street. William Stackwood, a builder's surveyor who worked opposite Freshwell street. John Mallows Youngman was the son of a local bookseller, and a noted artist who exhibited many times at the Royal Academy. For many years two of his paintings hung in the Town Library. James Humphreys, a trustee of the Hill St. Baptist Church for 42 years. He died August 1858 aged 69 years, and was buried in the small cemetery there. The earliest members were all men, ladies were admitted after 1838. 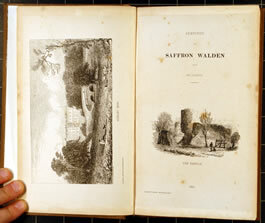 This book, (Sketches of Saffron Walden, published in Saffron Walden, by Youngman in 1845,) was by one of the Literary Scientific Institute's founders, John Player, and illustrated by another, John Mallows Youngman.